Cormorants are not rare, and until I spent some time photographing this pair on Monday, I didn’t think they were particularly lovely. They were interesting but aesthetically challenged. Boy, was I wrong. Up close, they are gorgeous birds. 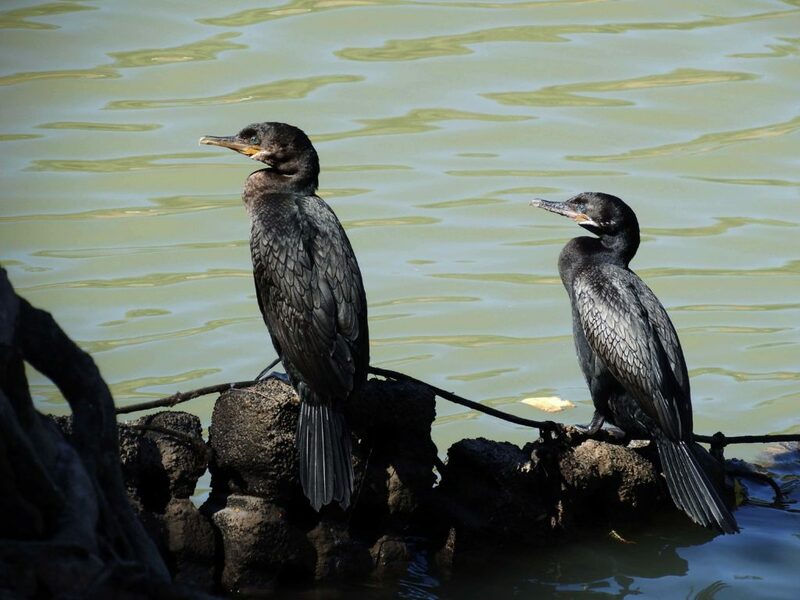 These are Neotropic cormorants. They are a Central and South American bird; the only places in the US that you can reliably find them are on the coast of Texas and Louisiana. So, if you have some out of town birders visiting, take them to the south-side paths just east of the Sabine bridge. 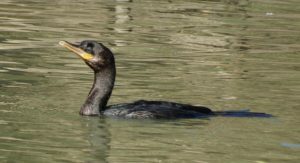 You will usually find one or two Neotropic cormorants hanging out and your visitor will likely get a life bird. The rest of the US (and here, too) is well supplied with a different cormorant, the double-crested. 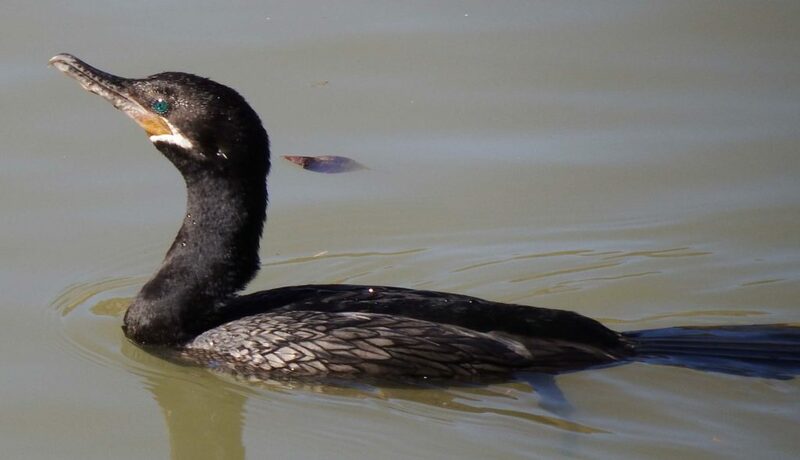 The distinction between double-crested and Neotropic cormorants is subtle having to do (outside of breeding season) with things like the angle of skin around the beak. I consulted Scott Kiester, one of my favorite birders to make sure I wasn’t wrong that these are both Neotropics. 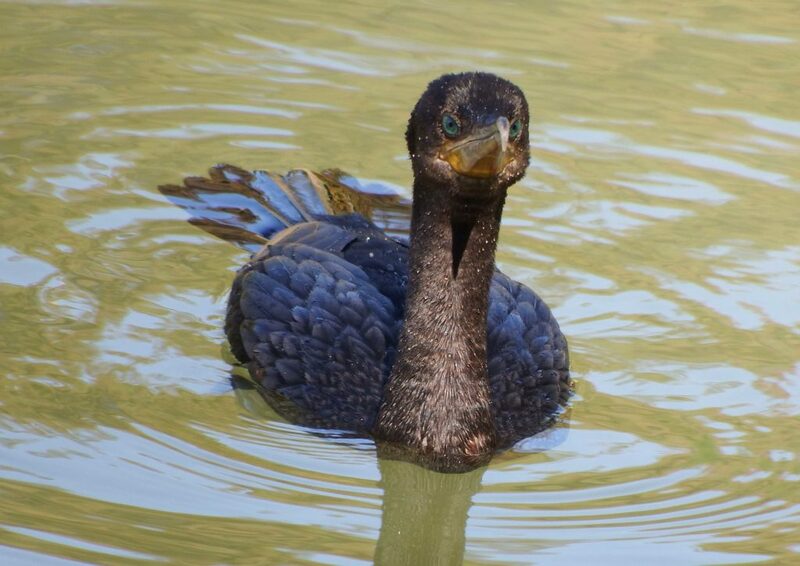 Cormorants are that rare bird, the triple threat; they float, they fly, and they swim underwater. Accomplishing all three is a physiological tour de force. Birds use two techniques to keep themselves atop the water. First are the feathers themselves. Birds have feathers that lock tightly together by means of barbules, tiny hooks on each feather strand. Floating birds have them on most of their feathers. The barbules allow the bird to seal its feathers tightly, trapping a pocket of air between the bird and its feathers. That pocket of air creates buoyancy. In addition, most birds (and all floating birds) have an oil gland at the base of their tail. When a bird preens itself, it uses its beak to distribute oil from this gland across its feathers. This keeps the feathers supple and creates an additional layer of water resistance. Cormorants float low in the water. 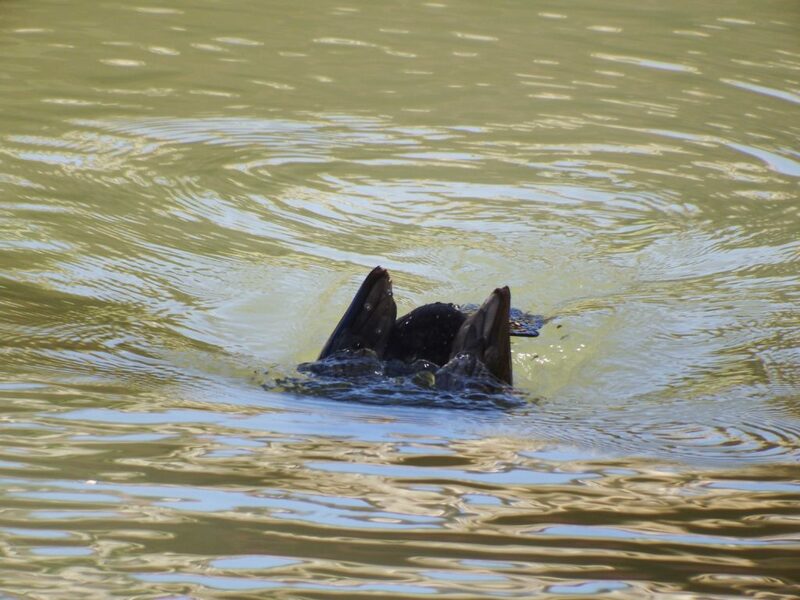 Cormorants, not only float but also dive beneath the surface to swim. If a duck ducks underwater, it will pop to the surface. Cormorants need to stay underwater, yet still, float when they want to. To do this they go halfsies on the barbules, missing them on parts of their feathers. This absence allows the water to soak in a little, reducing buoyancy. In addition, the oil in their glands isn’t quite as waterproof as in some other float-only birds. Because of their compromise on buoyancy, cormorants float low in the water. When they want to dive, they pop their head under and the rest of the bird just follows along. 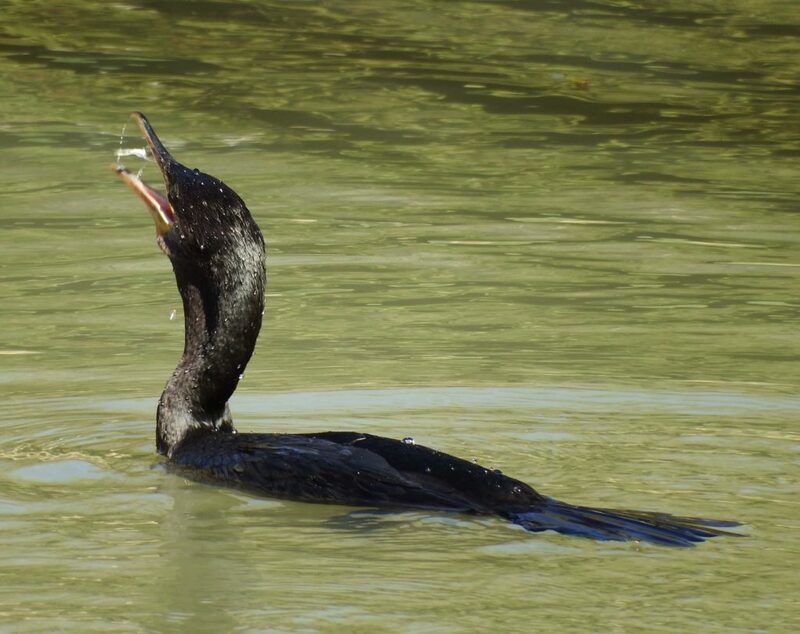 Excellent swimmers, cormorants use their webbed feet to propel them in pursuit of tasty fish. 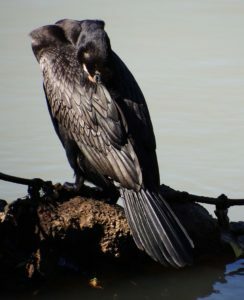 Unlike ducks which shed water, cormorants get wet and they have to dry off. 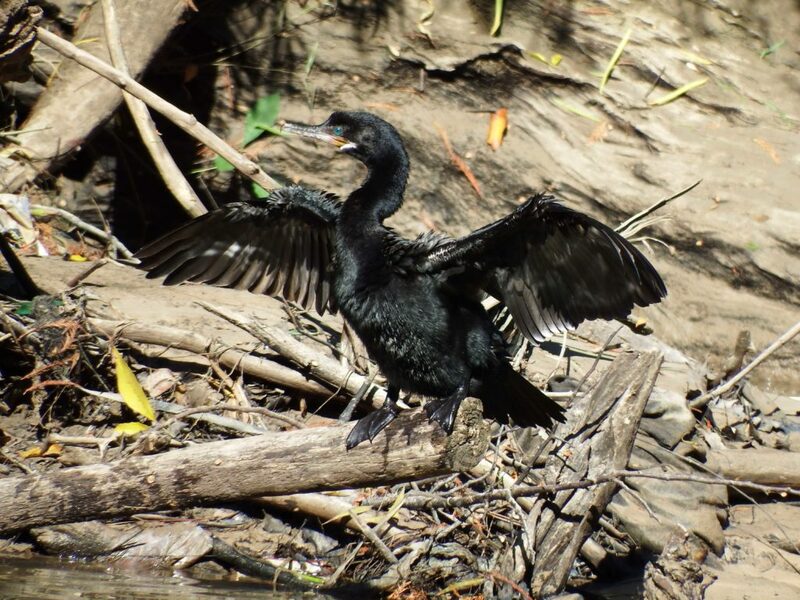 This results in the archetypal cormorant pose: wings akimbo, feathers spread. Cormorants air dry. The only other bird I know who does this is an anhinga. I have never seen one in our Park, but they are not uncommon at Brazos Bend State Park. Cormorants also fly. And again, this results in compromises. An efficient flier needs relatively large wings. But an efficient swimmer needs shorter wings that can act as rudders and not slow them down. The ultimate swimmer, the penguin, has really stubby wings. They can’t fly. Albatrosses, the ultimate fliers, have the largest wingspans in the bird world. They can remain aloft for months. Swimming, not so much. Our cormorants have wings large enough to fly but small enough to swim. They are a bird defined by compromise. But did you get a look at those eyes!